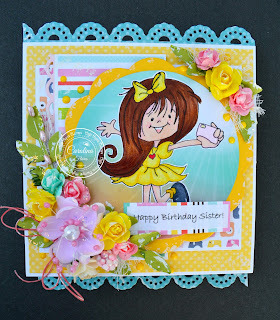 High Hopes Stamps: Easel Birthday Card!!! I'm so excited to share this happy and fun Easel Birthday Card today. For today I am using "Sally Takes A Selfie". This is such a cute image to used for many occasion? The image was color with alcohol makers. Unfortunately I don't have the list of the makers I used. My sincerely apologies :) Something I love to do is fussy cut my images it is so relaxing to me! The pattern paper is a 6X6 pad from Echo Park called "Summer Dreams" just the perfect paper for this adorable image. Also using my new "Lace Borders" die from Lawn Fawn and some "Dandelion Yellow" NUVO crystal drops. Love how stunning the flowers look with a little bit of Texture Paste & Diamond Stickles. I hope you enjoyed my post today. What a cute image and an adorable card. Love the design and pretty elements.